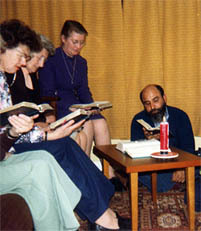 Secular Institutes were formally recognised by the Church in 1947 as a form of consecrated life in the apostolic constitution Provida Mater. Members of Secular Institutes live entirely in the world. Like all other lay people they share the responsibility to live gospel values and attitudes in family and social relationships and in the workplace, whether it be the office, factory, shop, hospital, school etc. They are also committed to being involved in the life of the Church. They are called to live their commitment through poverty, chastity and obedience. "The Holy Spirit has given rise in our time to new expressions of consecrated life, which appear as a providential response to the new needs encountered by the Church today as she carries out her mission in the world.